The dumplings in soup (上湯水餃) are really flavoursome as you'll have more ingredients and more texture in the fillings if you enjoy it in a traditional Hong Kong noodle restaurant. Every time I went into a noodle shop in Hong Kong, I’d definitely order either wonton or dumpling noodle soup. Are there any big differences between these two noodle soups? The fillings of both are mainly pork mince and prawns. But for dumplings in soup (上湯水餃), there are some extras, wood ears, mushrooms and bamboo shoots. More ingredients mean more delicious. Wood ear has a crisp texture. So you can imagine how balanced the texture of each dumpling you’d enjoy of every bite. When it comes to making your own dumplings in soup, you can skip anything except the wood ears. I just feel wood ear is the signature ingredient that makes these dumplings so special. Wood ear is rich in protein and very nutritious, often used in Chinese cooking for its crisp texture and ability of taking up all the flavoursome seasonings. Often times, I just cook a few dumplings in soup with bok choy when I need a light meal. Mix the prawn meat with a little of salt and corn flour. Leave them for about 15 to 20 minutes. Rinse and pat dry with kitchen papers. Cut each into 3 to 4 pieces. Mix pork mince with marinade. Stir in the prawn, mushrooms, bamboo shoots, wood ears. Cover and chill in fridge for about 20 minutes, or until you’re ready to wrap dumplings. Put a heaped spoon of fillings in the middle of a wrapper. Damp the wrapper around the fillings and seal the filling tightly, leaving the wrapper edges loosely. No need to make it perfect. Just make sure the fillings won’t leak out while boiling. Repeat this step to finish wrapping with the remaining fillings. Bring the chicken stock to a boil over high heat in a pot. In the meantime, carefully put dumplings into another large pot of boiling water over high heat. Stir the water with chopsticks in order to avoid the dumplings stick to the bottom. When the dumplings float to the water surface. Immediately transfer them into the chicken stock. Add bok choy and cook for a while. Season with salt. Sprinkle spring onion and sesame oil. Serve immediately. Dumpling wrappers are available at Asian stores. Make sure to get the dumpling wrappers for making soup, not that one for pan-frying. The texture is quite different. If you can't find any, you can replace with wonton wrappers. This time I used the ones for making Shanghai wontons, really silk soft. To prevent wrappers from air-drying while wrapping, cover the unused ones with a damped cloth. 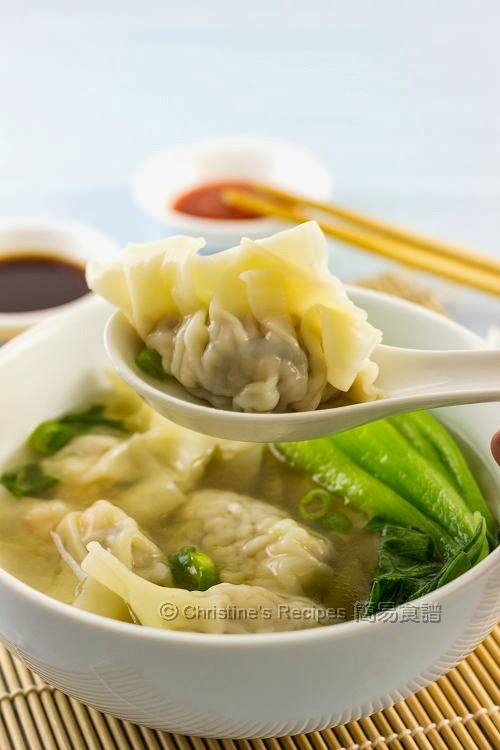 Using another pot of boiling water to cook dumplings will help to keep your stock clear. The uncooked dumplings can be stored in freezer up to 3 weeks or so. Whenever you’re craving dumplings, just cook the frozen dumplings in boiling water for a bit longer, until they float to the surface. To freeze the uncooked dumplings: Place the wrapped dumplings on a plastic film in one single layer, without touching one another, in freezer for about 20 minutes or so. When they turn harder, you can transfer them in a plastic bag. They won't stick together when frozen. Beautiful dumplings. I like the way you wrapped them. BTW I didn't know that there are wrappers for soup and for frying. Next time I drop by the Asian groceries I'll check. 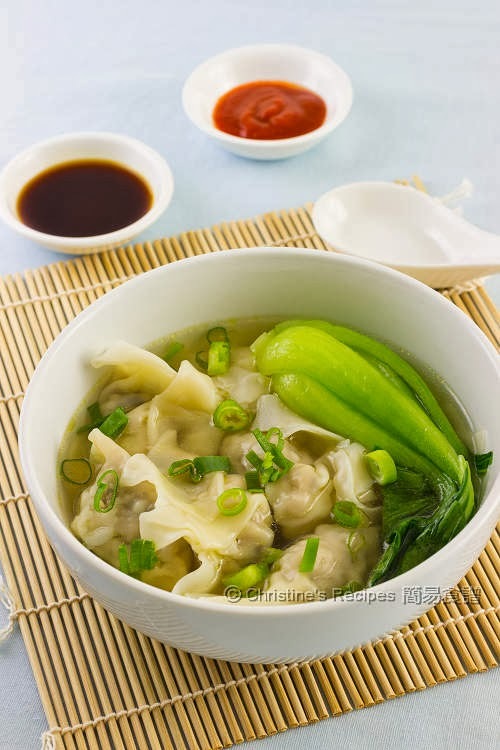 This bowl of delicious dumpling with hot soup is just perfect for a cold day or maybe for supper! Thanks for sharing Christine. It looks so delicious. Could I please have a bowl? Lol. I have a question for you. 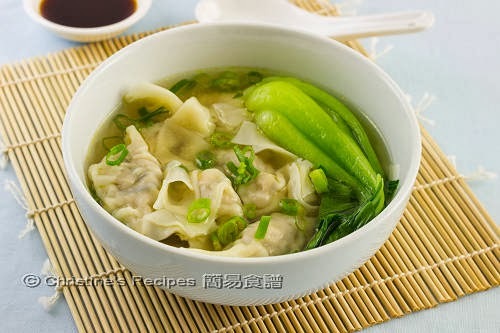 I tried to make wonton before but they were bursed all the time... Do you have any idea? Thanks so much. Really love your blog and recipes. 3 very simple rules: 1) Don't overstuff 2) Make sure water is not boiling aggressively 3) Remove gently as soon as they surface. I have tried storing the stuffed dumpling in the fridge but they tend to stick all together or on the container. How to prevent this? The wrappers will stick together especially when they are moist. I usually freeze the uncooked dumplings. They will keep longer as well. Whenever I need them, just cook them in the boiling broth, no need to thaw them in advance. Just cook for a longer time and make sure they are cooked through..
You have to place the wrapped dumplings on a plastic film in one single layer, without touching one another, in freezer about 20 minutes or so. When they turn harder, you can transfer them in a plastic bag. They won't stick together when frozen. Love your recipes Christine! just wondering, what's the purpose of salting and cornlfouring the prawns please? By doing so, the texture of the prawns will be kept smooth and nice after cooking. 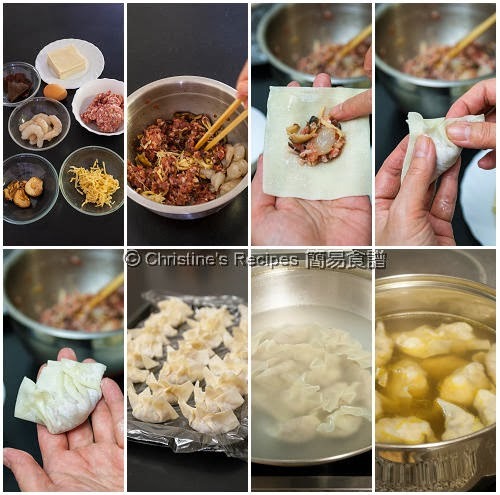 Hi chimtistine, can you do a video showing how these dumplings are wrapped? They look so pretty. Thank you! I have several tutorial videos of wrapping dumplings posted on my youtube channel. Please see the links on the right-hand sidebar. Great recipe - just what I was looking for! I love the crunch from wood fungus, and I love bamboo, but not water chestnuts are are so often in water dumpling recipes. This was a tasty recipe - took a little longer than expected to wrap as I kept tearing the delicate wonton wrappers - but the seasonings are right - will be keeping this recipe for sure! Thanks Christine! These dumplings are my favourite childhood snack. The noodle restaurants in HK sell this kind of dumplings with bamboo shoot inside. So I follow suit. Practice makes things perfect. You'll get there next time. Hi Christine, is it fine to substitute minced pork with minced chicken as I have friends and relatives that do not take pork. Thank you. Sure, you can use minced chicken instead. Hi Christine, I'm would like to know about the dumpling soup ingredients. I used chicken stock. I have a home-made chicken stock recipe on this blog. Feel free to use it. Do you reconstitute/soak dried mushrooms or are they fresh? Yes, you need to soak the dried mushrooms beforehand. Mentioned this in the ingredient list. My waltons are bursed .What should I do? Did you wrap too much fillings inside? If the dumplings are too full, the wrappers will burst because they'll expand while cooking.